Let's face it. Toys can be expensive. And if you are like most parents, you probably have a whole pile (or two) at home that your preschooler doesn't even look at anymore. A toy swap or exchange is a great way to get rid of some of those unused toys while picking up some "new" ones that your little one might enjoy at little to no cost. Everyone wins. Your child gets some new playthings while you get some extra space in your house. Here's how. Gauge people's interest. Most parents will respond positively to the idea of a toy swap, but you want to make sure you'll have enough items to exchange and people to participate. Decide on a location. Jenny Pollack, a mom from Bay Ridge, N.Y. who organized a toy swap one holiday season, said bigger is better. Even if you wind up not using all of the space, you'd rather be in a spot that is too large than too small. More space just gives you more room to organize and more room for people to browse and walk around. Ask whoever is letting you use the space if they have tables and chairs or if you'll have to provide your own. Enlist help and decide when you'll hold your event. Even if your toy swap is small, you'll still need some assistance. Pollack found three or four moms who were willing to help before the exchange (organizing items and assigning them values), during the exchange and afterward to clean up and box up anything that was remaining so it could be donated. When picking a date, go by when the location is available and when you'll have the most help on hand. Also, figure out what you'll be doing with any leftover toys. Set rules. Will you accept new toys? How used is "gently used?" Will you accept games and puzzles that are missing pieces? Do you want items to be cleaned and/or laundered before they are dropped off? Is there a limit on the number of things someone can bring? Is there any category of toy you won't accept (violent or war toys for example)? How far in advance should people bring items to be exchanged? Will children be allowed at the event? Will you be exchanging clothing or baby gear or are you just limiting the swap to toys? Does a toy need to be working? It is best to spell out your expectations clearly and early. Get the word out. Start making phone calls, sending e-mails and posting flyers. Pollack posted the details of her exchange on a couple of computer groups that she belonged to. Make sure anything you send out includes all of the details, the date, the time, the cost (if you are charging to enter) what you are looking for and any rules you may have set. Include contact information such as an e-mail address so people can query you if they have questions. Get there early the big day. 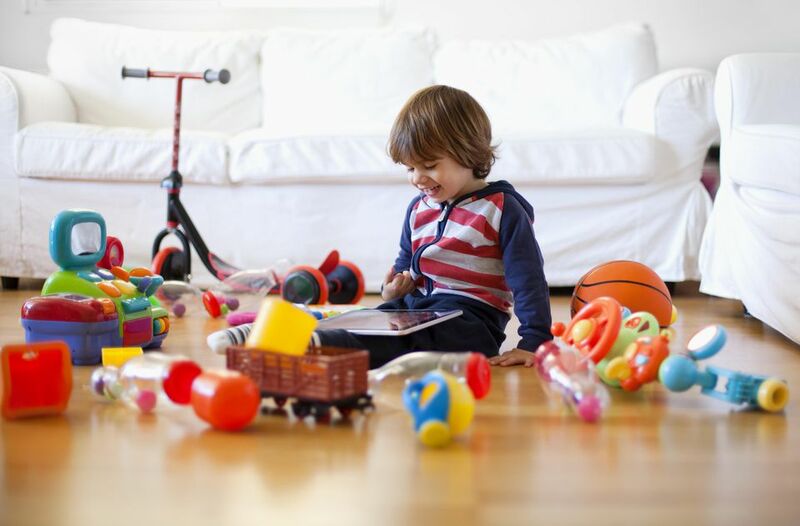 Come up with categories -- common ones include stuffed animals, cars, and trucks, dolls, and dollhouses, building toys, books, games and puzzles, outdoor toys and sports equipment, arts and crafts, baby toys, video games, and DVDs. Obviously, you can create your own as needed. Pollack, who accepted items the day of the swap and while it was going on, said her team of moms would immediately jump on a bag of toys as it was brought in and would start sorting and getting everything organized quickly. Come up with an exchange system and currency. Some toy swaps keep it simple -- a toy for a toy. Others, like Pollack's, assign a value to each toy and the donator got that number of tickets (a toy valued at $5 would earn the person five tickets). This is better and fairer if you are expecting some bigger items like bicycles or scooters. Just be consistent and make sure that everyone is on the same page. Swap! Make sure there are plenty of helpers (maybe volunteers could all wear the same color or hats or buttons to distinguish them in the crowd) to assist and answer any questions. Have bags and boxes on hand so people can carry things out. Once the swap is over and the last toy has been exchanged, it's likely you'll have some items left over. Box them up and either donate them or have people take them home (whatever you have decided in advance). Make sure the space is as clean, if not cleaner than when you found it. Thank everyone for helping. Evaluate how it went. Was your swap a success? Would you do it again? What would you do differently? Think hard about the location. Some toy swaps are held in private homes, but if the idea of lots of people (some of them strangers) traipsing through your house is unappealing, then consider finding more neutral ground -- a church, firehouse or community center are all good candidates. Once you've chosen, go over the ground rules and details with the space's owner -- how many people are allowed inside at once? Is there a fee? How long will you have the space? Is there parking? Are you allowed to hang signs on the walls? Are there restroom facilities? Are food and drinks allowed inside? Do you need separate insurance? Consider not allowing children to attend the exchange. For Pollack, this was key, noting that if you put kids in a roomful of toys they are going to want to play with everything right then and there. Not to mention if you are giving away some of your child's toys, he might not be happy about it -- even if he hasn't played with something in years. Be sensitive (and realistic) when assigning values to items. This is tough because you may be looking at an old doll whereas a participant may be seeing her daughter's first plaything. If you think something is worth $2 and the person donating feels it's worth $7, try meeting them halfway. Pollack said she was casual about it, setting prices like she would at a yard sale and noting, when all was said and done, most people wound up with more currency to "buy" toys than they needed. Come up with a plan for the leftover toys, because it's likely that the people who brought them aren't going to want them back. After her toy swap was complete, Pollack donated the items that were not chosen to the church in exchange for hosting the swap. You can also pick a charity or see if local preschool or library is interested in taking them. Relax and try to have fun with it. You are doing people (and yourself) a service. The goal is to (hopefully) save people money while helping them get rid of some clutter. The bonus is that it's likely a charity will wind up with some great items and your kids will get some "new" toys. Lots of gently used children's products -- toys, DVDs, games, books, bikes, etc. General supplies -- paper, tape, tacks, markers, etc.